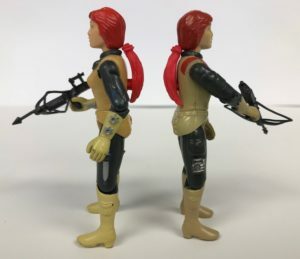 In 1982 Hasbro re-launched G.I. Joe with the new branding “A Real American Hero.” With 13 heroes, two Cobra enemies, and a mail-away Cobra Commander, Hasbro made a calculated decision to minimize their initial risk. 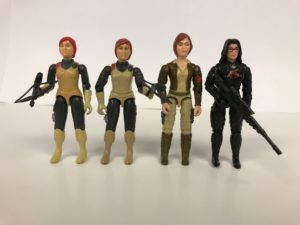 Re-using sculpts, averaging paint applications, and choosing what characters they thought would resonate most with their target audience, 7 to 11 year old boys, one action figure was beyond unique, the lone female, Scarlett. Scarlett shares no parts with her 1982 colleagues. With the success of this boys’ toy line not assured at launch time, it seems even riskier to manufacture all specific tooling for just one character, particularly one that may not be popular to begin with! Here’s a first look at Scarlett. As a female there are some differences between her and the boys. Most notably is the waist. It’s shorter than the male waist. As such, she works best with a smaller o-ring. She’s loaded with details though. With a relatively simple chest sculpt, she has her textured red pad on her right shoulder, and a small grenade hanging on her left. Little details like this tell that Shana is right handed, as her rifle stock would rest agains the shoulder of her shooting hand, and the right hand can grab the grenade easier. Plus, there’s a couple more tells! The small pistol molded under her right wrist. The throwing stars atop her left wrist. She’s the G.I. Joe team’s original martial arts expert and intelligence and espionage member. The only detraction that many collectors find with her figure is the head sculpt. Many don’t think it’s attractive. Bobbed short red hair didn’t add to the femininity, either. Here’s a good side by side of 1982 and the 1983 “V1.5” release. 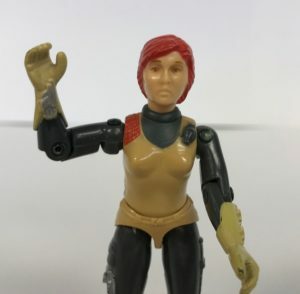 1983 saw the addition of new arms with the swivel arm feature adding 2 more points of articulation, up to 11 points for a 3.75” figure. There’s minor differences in the torso, mainly the backpack peg hole. 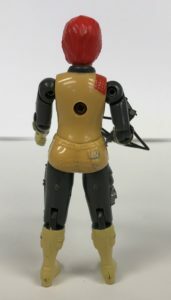 In the above view you can see the knife/dagger on her left leg, and possibly what is a communications device on her right. 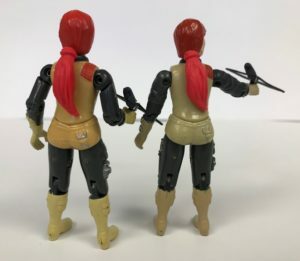 Like most of her molded on weapons/accessories, they are painted silver, and that silver paint is easily rubbed/chipped off. Also note her weapon: the XK-1 Power Crossbow. An experimental silent weapon is perfect for the G.I. Joe martial arts espionage expert. One other interesting point is that she does not have any peg holes in her feet. In making her, they made her feet smaller than the guys’. That left not enough room for them. She is the only figure made that doesn’t have them. This makes her semi-difficult to display. Most G.I. Joes can rest on stands or hang off on vehicles. Scarlett gets to ride along seated, or come up with a sticky solution, or trust simple physics and no one to bump into your display. Out back you see one more final detail, a silver “Dennis the Menace” style sling shot in her right back pocket. She’s equipped for everything! I decided I needed this shot to show some progression of the female action figures through 1984. 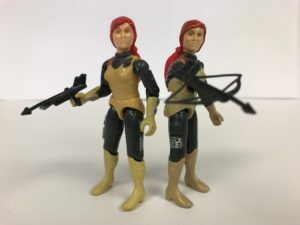 Hasbro released a “token” female every year through 1987, and then Scarlett would be re-released in 1993, the only lady to get that treatment during the original run. 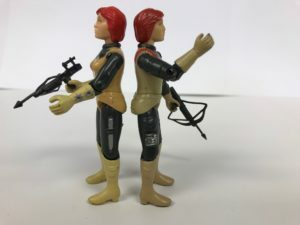 1983 introduced Cover Girl, and then 1984 introduced the Baroness, the most popular female, which showcased how far Hasbro progressed making “miniature dolls.” Cover girl got man-ish boots to get that foot peg and a more feminine head sculpt. 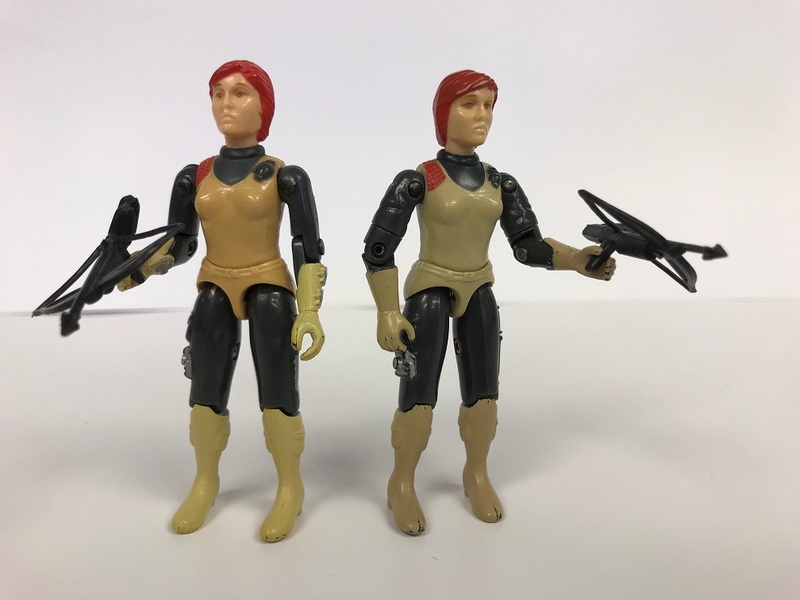 Baroness got rubber hair, a smaller face and made the feet smaller than Cover Girl, but still retained the peg hole. So with this shot you may see a hint of something different. Bam! Credit @hypnoshield on instagram and twitter for the new must have accessory for Scarlett. No, not a handbag, her trademark ponytail! In every other media presence, this is a staple to her design, and sorely missing from the original figure. Custom cast in red for a near match, you probably need to do some shading matching. (Depending on how much variation in paint and paint discoloration). Here’s a side by side so you can see how it fits in the back. The 1982 figure has it sticking out a little bit so it needs some shaving to fit nicely like the 1983 figure setup. As an action figure, Scarlett is a 8 out of 10. Because she’s a popular member of the original team, she’s a must have in most any collection, greatly outshining any sculpting inadequacies. If you only get one, get the 83 swivel arm version, although the’ 82 seems to be more available. And don’t forget to add @hypnoshield’s ponytail!